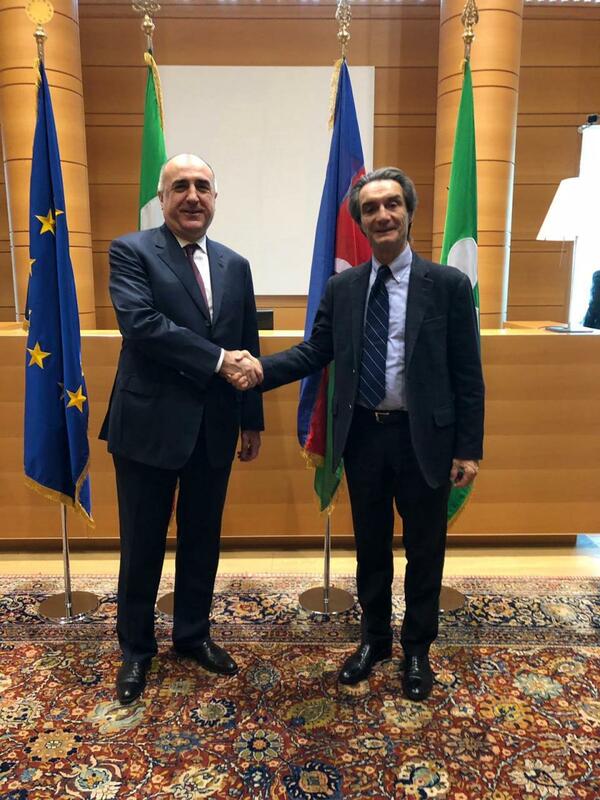 Azerbaijani Foreign Minister Elmar Mammadyarov held a meeting with Attilio Fontana, the president of the Lombardy Region of Italy in the framework of his visit to Milan. 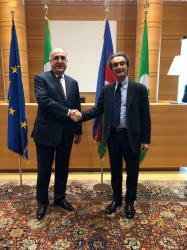 Minister Elmar Mammadyarov marked the intensification in the relations between Azerbaijan and Italy over the last years. He recalled the official visit of the Italian President Sergio Mattarella to Azerbaijan in July of this year and negotiations held with the Azerbaijani President Ilham Aliyev. The minister mentioned the opening of the Polymer Plant constructed by the Maire Tecnimont Company in the framework of “SOCAR Polymer” project within Sumgait Chemical Industrial Park with the participation of both of the Presidents. Speaking about the development strategy of Azerbaijan, priority development directions, regional and globally important projects of Azerbaijan, including the leading role of the country in realization of the Southern Gas Corridor, Mammadyarov invited Attilio Fontana together with the representatives of economic and scientific-academic circles of the region to Azerbaijan in order to get better acquainted with the country and discuss the cooperation opportunities in various fields. “Taking into account the high level scientific-technological potential of Lombardy, the development of relations between the higher education and scientific research institutions of both sides would be beneficial,” he pointed out. Bilateral beneficial cooperation exists in all areas, including the economic area, and Italy is the main trade partner of Azerbaijan. It was underlined that many Italian companies are operating in Azerbaijan, cooperation exists with the biggest Italian companies like Saipem, Eni, Snam, Maire Tecnimont whose headquarters are located in Lombardy, as well as the existence of direct flight between Milan and Baku is important from the point of developing relations between the two states in the sphere of tourism. Taking into account the crucial role that the Lombardy Region plays in economic and cultural life of Italy, certitude was expressed on additional contribution this region would make in further development of Azerbaijan-Italy relations. Diplomatic relations between the two states were established in 1992. Bilateral relations continue to grow and expand in a number of directions. Accompanied by a solid consolidation of the political dialogue, bilateral economic relations have further strengthened following the signing of a Joint Declaration for the establishment of an Italian-Azerbaijani Council for Economic, Industrial and Financial in 2004. Italy, as the main importer of crude oil and oil products from Azerbaijan, has become the largest trading partner of the country. Italy ranks first in terms of its share in the Azerbaijani exports. In 2017, Italy accounted for more than half of trade with the EU countries ($4.7 billion). Baku and Rome are strategic partners in the energy sector. Italy, whose scanty natural resources traditionally make the country dependent on import has been a key partner for Baku. Since 1999, Italy has begun to receive a large part of Azerbaijani oil exported through the Baku - Supsa pipeline and then through the Baku - Jeyhan. This made Italy the number one partner for Azerbaijan and this position is maintained until today. Moreover, Italy supports the development of the Shah Deniz 2 field, with further export of the natural gas from the field to Europe via the Trans Adriatic Pipeline (TAP). Italian business circles in Azerbaijan are making large investments and are taking part in a number of projects of international importance. As many as 95 Italian companies have been registered in Azerbaijan and are contractors in 41 projects. The priority target of Italian investments in Azerbaijan is construction sector. The Italian presence is strengthening in the interior design industry, the hotel infrastructure, the agro-wine division and the banking sector. Currently, the work is underway on development of a draft new agreement on the promotion and protection of investments between Azerbaijan and Italy, a joint action plan providing for cooperation between the two countries in the fields of energy, infrastructure, logistics, railway, agro-industrial complex, petrochemical industry and other areas. Azerbaijan remains an extremely interesting market for Italian businessmen.